If you don’t have the need or the budget to upgrade your smartphone, then the next best thing is buying an upgrade for the phone you’ve already got. Cases, battery packs, and wireless charging pads are the obvious calls, but there are a ton of more exciting upgrades out there for you to spend your money on too—and these are some of our favorites types. No matter how good or otherwise the camera is on your phone of choice, adding some clip-on lenses can make a real difference to the quality of your snaps. You can buy fish-eye lenses, macro lenses, wide-angle lenses and more—just make sure the lens packs you’re getting are going to fit your handset. Of course the add-ons you pick up are going to work in every app that uses the camera: It’s an easy and eye-catching way to upgrade your Instagram photos, for example, or create Snapchats that are going to make your friends and family actually pause in their endless scrolling through the Stories feed. You’ve got plenty of lens packs to pick from: Olloclip, Moment, Aukey, and CamKix all make lenses that are worth checking out, though, as usual, you should always check online reviews before buying (preferably left by people using the same phone as you). If the world’s data and tech systems come crashing down in advance of a global apocalypse—or maybe you’re just spending a peaceful day in the great outdoors—dedicated phone antennas can keep you connected even when you’ve got no cellular data signal. These antennas create a mesh network, enabling private communication between connected devices. If just one phone on the network catches a cell tower signal, then everyone can use it; meanwhile, every node on the network can send messages, GPS locations and other useful data from phone to phone. You can’t stream Netflix, but you can at least keep in touch. GoTenna Mesh is the most impressive of the products on the market at the moment, with a two-pack yours for $179, while Beartooth ($249 for two) focuses on keeping two phones in constantly communication, and the interesting-looking Sonnet ($89 for two) is now available to preorder after a successful Indiegogo campaign. The fight against shrinking smartphone storage is one that’s never really been won—thanks a lot, 4K video—but with the right upgrade you can make sure you’ve got enough spare room on your phone when you need it. Buying a USB storage device that physically plugs into your phone saves you from having to hunt for Wi-Fi or pay out for some cloud storage space every month. For iPhone users, you’ve got the likes of the SanDisk iXpand Flash Drive ($120 for 128GB) and the Kingston DataTraveler Bolt Duo ($119.99 for 128GB). Android is friendlier towards USB storage and if you’ve got a USB-C phone and a USB-C flash drive you can just plug one straight into the other to access files. For older micro USB phones and standard USB-A drives, you need a USB adapter like this $6 one: Just double check the documentation that came with your phone. If you’re going to game on your smartphone, do it properly—having a dedicated gaming accessory can make a huge difference to the way you game on mobile, saving you stabbing wildly at the screen and trying to control the action without any physical buttons. You need a controller that works with your phone, of course. With an iPhone, look for the MFi (Made For iPhone) badge on the box: The Megadream Wireless Gamepad ($59.99) and the Gamevice Controller Gamepad ($79.95) both come highly recommended by reviewers and are both compatible with a number of iOS devices and many different games. Over on the Android side of the fence, you’ve got more sizes of device to consider and a host of decent options to pick from. The SteelSeries Stratus XL ($43.65) works with both Windows and Android, though there’s no integrated phone holder, while the Moga Pro Power ($29.99) does have a phone holder, supports a wide variety of Android phones, and won’t cost you much at all. And we’re always a fan of 8BitDo’s Bluetooth controllers that remind you of the halcyon days of 16-bit. The SN30 PRO is just $50. Chances are you do a bit (or a lot) of filming on your smartphone, and adding a hand-held gimbal to the mix can really make a difference to the smoothness and quality of your finished clips—it’s a better investment than a selfie stick, anyway. When you get up to 4K resolutions, that extra stabilization tech becomes even more valuable. The new Osmo Mobile 2 from DJI looks like a good bet, works with just about any phone, and will set you back $129—it comes with some special tricks such as a hyperlapse mode as well. Other popular options include the Zhiyun Smooth-Q ($99) and the Hohem T2 ($159.99). 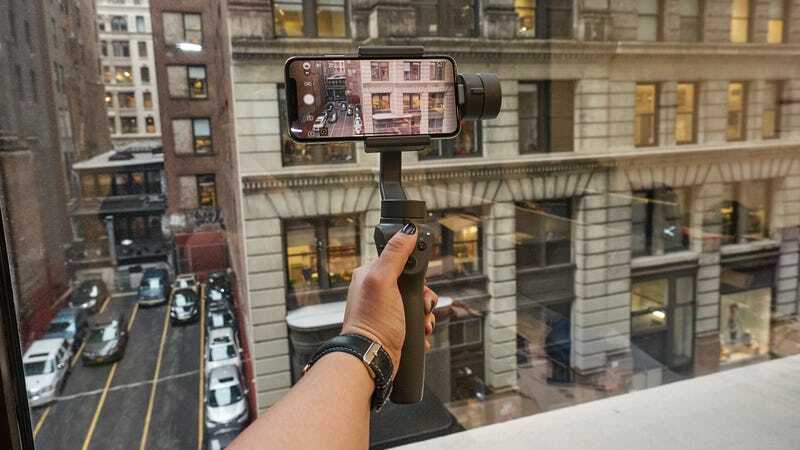 Look for gimbals with a long battery life, easy options for connecting and sharing your video (usually via an app), and extras such as the ability to charge your smartphone while you’re busy capturing all that wonderfully steady footage. Lightness and compactness are important too if you’re going to be lugging this around with your phone. What Do the AI Chips in New Smartphones Actually Do?